176 – 218 inches of snow. In three days! This Afternoon Snow. Could be heavy at times. High near 23. Wind chill values as low as -7. Windy, with a south southwest wind around 85 mph, with gusts as high as 115 mph. Chance of precipitation is 100%. Total daytime snow accumulation of 33 to 39 inches possible. Tonight Snow. Could be heavy at times. Steady temperature around 21. Wind chill values as low as -7. Windy, with a south southwest wind 85 to 95 mph, with gusts as high as 115 mph. Chance of precipitation is 100%. New snow accumulation of 37 to 43 inches possible. Friday Snow showers. Could be heavy at times. Temperature falling to around 15 by 4pm. Wind chill values as low as -13. Windy, with a south southwest wind 80 to 85 mph decreasing to 70 to 75 mph in the afternoon. Winds could gust as high as 115 mph. Chance of precipitation is 100%. New snow accumulation of 23 to 29 inches possible. Friday Night Snow. Could be heavy at times. Low around 14. Wind chill values as low as -13. Windy, with a south southwest wind 70 to 80 mph, with gusts as high as 115 mph. Chance of precipitation is 100%. New snow accumulation of 21 to 27 inches possible. Saturday Snow. Could be heavy at times. High near 19. Windy, with a southwest wind 75 to 80 mph, with gusts as high as 115 mph. Chance of precipitation is 100%. New snow accumulation of 22 to 28 inches possible. Saturday Night Snow. Could be heavy at times. Low around 17. Windy. Chance of precipitation is 100%. New snow accumulation of 29 to 35 inches possible. Sunday Snow. Could be heavy at times. High near 18. Windy. Chance of precipitation is 100%. New snow accumulation of 11 to 17 inches possible. H/T to Ice Age Now for link. On the Cusp of a Long Long Winter? China: The biggest snowfall in 52 years. Snow caused power outages in 57 villages, brought down thousands of trees and killed numerous domestic animals. Temperatures fell by as much as 14 degrees below zero in some areas. Hokkaido Electric Power company said the snowstorm has affected power transmission cables in the cities of Muroran, Noboribetsu, Toyako, and other cities and municipalities. The Japanese Meteorological Agency warned of continued snowfall through this evening, with cumulative snow expected to reach as much as 16 inches (40 cm) in the heavy-hit southern coastal areas of Hokkaido through tomorrow afternoon. David Phillips, senior climatologist with Environment Canada, said he was shocked to see that the 55 to 60 centimetres (about 23½ inches) of snow that has fallen on Regina this month has already surpassed all of last winter’s total of 52 cm. With a week left in November, Regina has already broken the monthly record of 53.7 cm set in 1941. The snowfall amounts are also surprising because the bulk occurred over five or six days, Phillips added. “It’s happened in huge, almost Paul Bunyan-like snowfalls,” he said. “Not to scare you, but whenever there has been a November with lots of snow, it seems to me you end up with a snowy winter.”Since 1883, Regina has received an average of 13.8 cm of snow in November. United Kingdom: Snow and cold on the way after flooding rains. The mercury is expected to plunge to -15C with widespread snowfall by Saturday kicking off an “Arctic week” and a month of winter misery for much of the UK. In the first taste of what promises to be one of the UK’s coldest winters in a 100 years, long-range forecasters warn that tonight’s cold snap heralds a freezing winter ahead. According to the Daily Mail, temperatures could plummet to minus 3°C this week and as low as minus 20°c (4°f) in some areas through December and January. H/T to Ice Age Now for some of the links. Shorter growing seasons is a sign that the next grand minimum is on the way. California Giant Berries South America manager Nader Musleh, told http://www.freshfruitportal.com the amount of damage to his company’s producers depended on the area, with some growers losing 80% of their crop while others lost 10%. via Frost damage hits late season Chilean blueberries | Fresh Fruit Portal. Dear readers, I could not contain myself and have returned to political blogging HERE. I will continue to post important long term climate change events on this blog. Researchers have found the Sun’s eleven-year solar cycle continued normally during the Maunder Minimum between 1645 and 1715, when sunspot activity was unusually low. This was also a time when northern Europe experienced unusually cold conditions. The discovery, reported in Geophysical Research Letters, comes as the Sun approaches solarmax, the climax of its cycle, when its north and south magnetic poles flip. The researchers were looking for solar cycle variations by studying beryllium-10 isotope concentrations in ice core samples. Showers of heavy isotopes including beryllium-10, are produced when cosmic rays, a high-energy mix of protons, electrons, and atomic nuclei from outside the solar system, collide with molecules in the Earth’s atmosphere. Increased solar wind activity as the Sun moves towards solar max, reduces the amount of cosmic rays reaching Earth. By studying beryllium-10 levels in ice cores, scientists can determine the level of solar activity at a given time. Drawing on two independent ice core records, Owens and colleagues modelled solar activity back to 1610, before the Maunder Minimum. “Between 1650 to 1710 there were no sunspots recorded, even though there were lots of professional astronomers around at the time,” says study lead author Dr Mathew Owens of the University of Reading in the United Kingdom. NOTE – A REASONABLE CASE CAN BE MADE THAT THE WARMING PEAKS OF A 60 YEAR PDO CYCLE AND THE 1000 YEAR SOLAR CYCLE COINCIDED AT 2000 +/- AND WE ARE LIKELY ON THE COOLING SLOPE OF BOTH. The clearest empirical measure of solar activity is the solar magnetic field strength. On an empirical basis Livingston and Penn have shown that the decline in solar magnetic field strength suggests that sunspots could disappear by about 2015 signalling THE START OF A NEW MAUNDER MINIMUM WITH SIGNIFICANT COOLING. Global Cooling – Climate and Weather Forecasting. Over the last 10 years or so as new data have accumulated the general trend and likely future course of climate change has become reasonably clear. The earth is entering a cooling phase which is likely to last about 30 years and possibly longer. The major natural factors controlling climate change have also become obvious.Unfortunately the general public has been bombarded by the scientific and media and political establishments with anthropogenic global warming – anti CO2 propaganda based on the misuse and misrepresentation of already shoddy IPCC “science” for political ,commercial and personal ends. Streaming into the solar system at nearly the speed of light, galactic cosmic rays (GCRs) are a high-energy mix of protons, electrons, and atomic nuclei. As they pass into reach of the outflowing solar wind, the propagation of GCRs is inhibited. Galactic cosmic rays that make it to Earth interact with the atmosphere, creating a shower of heavy isotopes including beryllium-10. Beryllium-10 isotope concentrations recorded in ice cores provide a long-term, high temporal resolution record of galactic cosmic ray flux. The rate of GCRs flowing into the solar system is thought to be relatively stable, so researchers suspect that shifts in these long-term isotope records must be driven by a change in the rate at which GCRs reach Earth. The propagation of GCRs to Earth, in turn, depends on the open solar flux, the fraction of the total solar magnetic field that is carried out into the solar system by the solar wind. Open solar flux increases with sunspot number and shifts with the orientation of the heliospheric current sheet, the wavy surface where the Sun’s the magnetic field switches polarity from northward to southward. Thus isotope concentration records can serve as a long-scale record of solar activity. Drawing on two independent ice core records, Owens et al. modeled the open solar flux back to 1610, a period that includes the Maunder Minimum, a 65-year stretch starting in 1650 when astronomers observed hardly any sunspots. They find that during this period, beryllium-10 isotope concentrations continued to oscillate following the roughly 11-year solar cycle, despite the dearth of sunspots. They suggest that the heliospheric current sheet’s cyclical behavior didn’t change during the period, and hence the regular cycling of the open solar flux, and the changing penetration of galactic cosmic rays, continued. Evidence of scientific fraud! Why do real scientist let this happen? It appears to be a fact that 1880, and many years after that, are getting colder by the year. Not only that but temperature means are getting warmer by the year for the later figures. Take 1996 for example. That has warmed by .06°C in the last 7 years! The anomaly has gone from 25 (.25°C) to 31 (.31°C). It is scary to think that the temperature back in 2005 can still keep climbing even in 2012. Is this something to do with parallel universes perhaps? Gov. Jerry Brown told attendees at an environmental conference Friday that climate change must be prevented or humans might one day be forced to live on another planet. Addressing the Greenbuild Expo in San Francisco, Brown lauded California’s cap-and-trade auction for greenhouse gas emissions, which began this week. It was the formal launch of the nation’s most ambitious carbon-trading market, which for the first time established a market-based system to put a price on greenhouse gas emissions. It is leadership like Governor Brown’s that will insure the majority of Californians will be ill prepared to cope with a predicted grand minimum, and potential little ice age. Governor Brown is held captive by his ideology and belief system, rather than observing the scientific data which points to a cooling trend rather than warming. Our ancestors that have lived through past little ice ages had to live indoors in the winter and wished they were living on another planet. Grand Minimum cooling crept slowly down and then accelerated. This snow fall record could be a sign of a slow creep toward a cooler world. 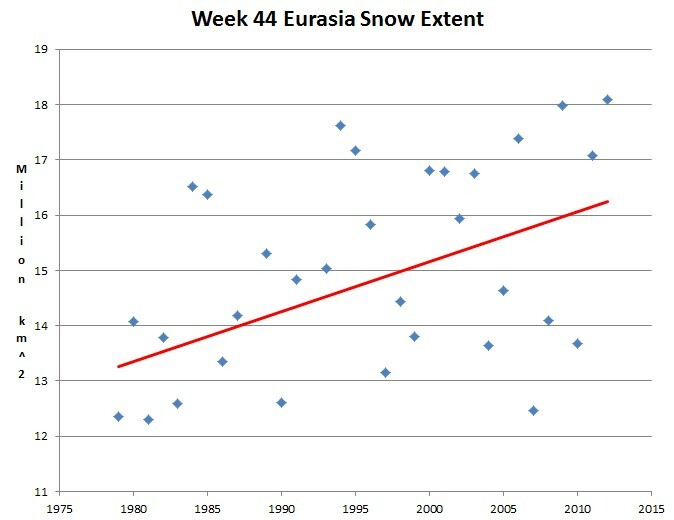 Autumn snow extent in Eurasia is the greatest recorded since the start of the modern satellite era in 1979, and has increased by 20%. The decreases in Earth’s snow and ice cover over the past 30 years have exacerbated global warming more than models predict they should have, on average, new research from the University of Michigan shows. 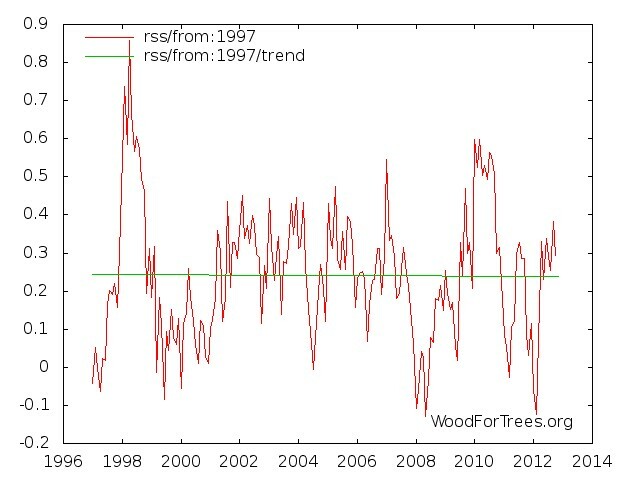 This exacerbated warming can be plainly seen in the temperature graphs.